This article was originally posted by Meredith Blakeway of S.O.F.T and was republished with permission. Yallah. Yallah. How do you describe Morroco? We caught the ferry from Tarifa to Tangiers. Then we had to unload the bus and the old, frail, disabled, fragile and hungover had to wheel all their luggage up and down slopes, up and down very hazardous gangplanks. While the Morrocan security were leaning on walls chatting to their mobiles, we had to lift all our luggage up onto these high conveyor belts, giving us all hernias, while no one checked anything. Then we had to ‘park’ them in the lower part of the ship. This was all repeated when we arrived. No one was allowed to help us, we had to do it alone! Not a good start, some never recovered! 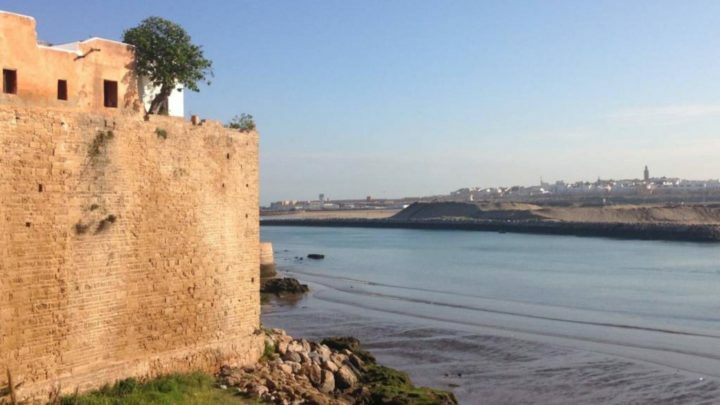 We the drove to Rabat, the capital, and home to the king, which everything is named after, and I mean everything! The landscape was unremarkable initially, low flat scrubby plains with sheep and goats meandering through the rubble. Some shepherds ‘watched their flocks’while some lay on their backs not watching their flocks. Well, it is the place for hashish! As we neared Rabat the scenery gave way to broken cement tenements, peeling paint and rusty abandoned cars. We stopped in Casablanca for lunch, a huge sprawling polluted city, not the charming fishing village of the movie world. The waiter at ‘Number 6’ was unable to give us change when we paid for our lunch … and then he came face to face with an Australian Maltese terrier (not me). Well she bombarded him in English, did not budge … If he wanted to be paid for lunch, he would have to give change. Suddenly the change appeared. The medina in Rabat was charming, as we were there before the locals had risen from their slumber. 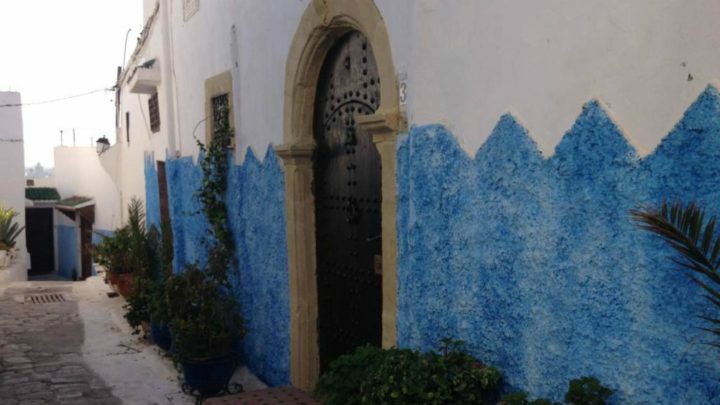 We were dazzled by the blue and white houses, owned for generations by the same families. The walled gardens hid the homes within. They were so much more appealing than the cement tenements where the majority have to live. The desert became more apparent as we headed towards Marrakech. Small brown villages clinging to the valleys with donkeys meandering through the arid land. Very biblical landscape. There were cacti scattered through the small crumbling villages and abandoned forts. All dun coloured and blending into the dry arid earth. Pink and green Marrakech, imitating the pink ochre of the soil, has median strips of flowers. Roses and multi- coloured bougainvillea festoon the main drag. Our hotel was five-star by Moroccan standards, with an opulent entrance foyer, but it was downhill from there. The food was very average and not everything worked. However, by now I am a specialist in procuring a quiet room, which was all that mattered to me. That night some of the crew attended the ‘1,001 Nights’ at the casino. 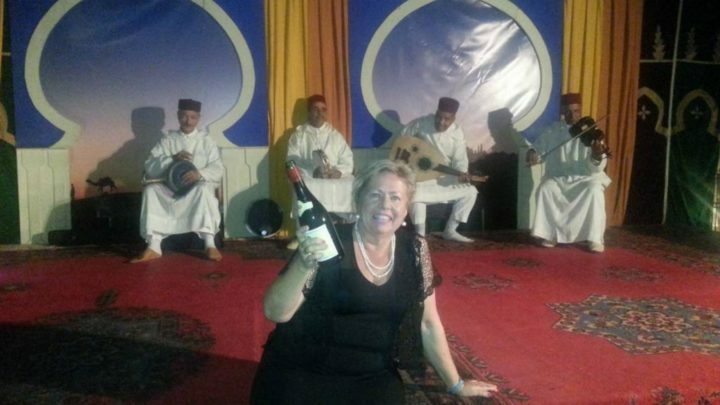 The food was fabulous, with curious entertainment provided by traditional Berber musicians. The dance troupe looked decidedly ‘challenged’ we could not work out if they had frantically enlisted the bell boys to help out, or they had spent too long in the tent!? They had problems with their right and left and kept bumping into each other. They looked odd, some had two heads. There were snake charmers, jugglers and acrobatics all wearing shiny red outfits, it was almost medieval. The snake charmer placed a huge scorpion on Miss America’s face. We think it had its sting removed, although the less charitable hoped it hadn’t! The medina/kasbah of Marrakech was lively the next morning. Snake charmers, vendors, water sellers with stylish hats (but don’t drink the water), donkeys, hustlers and hasslers all ready to take your cash. I was unable to buy any jewellery because they would not bargain at all. They were not interested in the game. I think Europeans are paying the high amount without question. It is very much a French town with a huge amount of French tourists sitting in cafes smoking! English is not spoken much. We visited a Berber home in the Atlas mountains the Ourika Valley. It had indoor donkeys and cows. The Berber hostess made special mint tea and served delicious flatbread with fresh butter and wild honey, which was full of flavour — hopefully not from the indoor donkey. I am afraid we started giggling over the sugar block which was a dubious shape. Our Berber hostess was shocked. Outside the house the touts and trinket sellers had gathered, attacking us like seagulls when we emerged with honey smeared faces. Cheap bracelets, probably made in China were thrust in our faces, at very high prices. Then they chased us on their motorbikes to the next stop, and reduced their prices. Sadly it was not the good stuff, but I did buy some just to appease Abdul. Our last stop was the Argan Oil Womens’ Cooperative. The cooperative supports local women in their harvesting and production of Argan oil, which is unique to Morocco. I have Argan oil dribbled over all of my clothes as it is very thick and dribbles out of the containers. 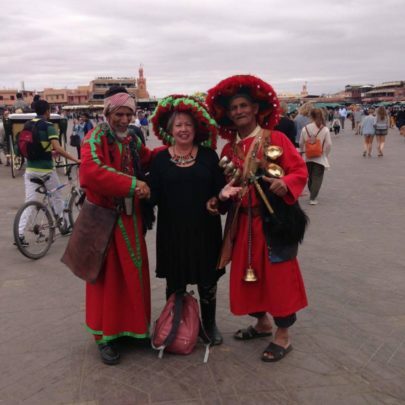 Is a visit to Marrakech, Morocco on your travel bucket list? What tips would you give to other travellers if you have already been?